This intimate Patagonian trip will be the adventure of a lifetime. You’ll be trekking along shining blue glaciers, hiking into the mountains and sailing rivers full of cormorants and sea lions. Our trip will begin in Puntas Arenas, known as “The End Of The World” and then head deep into the wilderness. Our guide will meet us at the airport and we’ll be transferred to our hotel. Evening at leisure. In the afternoon we’ll set out on a guided city tour. At the “Cerro de la Cruz” viewpoint we’ll enjoy panoramic views of the city. You’ll see the coloured rooftops and the Strait of Magellan. Our guide will give us the historical background of the city’s main monuments, such as Antoine de Saint Exupery Square, the neighbourhoods of Puntas Arenas and the Museo Nao Victoria. Evening at leisure. After breakfast we’ll set out for Magdalena Island. We’ll sail north through the Magellan Strait where we’ll see a colony of 60,000 Magellanic penguins. After we’ve met some penguins we’ll return to Punta Arenas. In the evening we’ll dine at a local restaurant. Today we’ll head to our lodge in Torres Del Paine National Park. Here you’ll find Patagonia’s famous snow-capped peaks. We’ll head north towards the Argentinian border. After lunch we’ll finish our trek towards our mountain lodge. We’ll enjoy some well-earned relaxation in the spa and have meal together. We’ll be hiking into the mountains where we’ll visit las Torres (the Towers). A third of the way up we’ll stop for cocoa at a relief station. Then, we’ll continue to the base of Las Torres and have a rest. We’ll have a packed lunch surrounded by stunning 360-degree mountain views. After breakfast we’ll head to Pudeto, board the “Hielos Patagonicos” and sail across the stunning Pehoe Lake. We’ll then trek up the French Valley passing lakes, rivers and streams. We’ll be greeted with views of Paine Massif. At the foot of the fearsome Mount Paine Grande, we’ll have a picnic at French Glacier and see a spot where great avalanches are often seen. We’ll check into our new lodge and enjoy an evening meal. Enjoy a good breakfast we’ll be setting out on a mighty trek. We’ll take an hour long sail past the icebergs of Grey Lake. At basecamp our guides will give us the orientation we need to take on the glacier. We’ll ride our zodiac boats to Grey Glacier and have a packed lunch. It’ll then be time to trek into a wondrous world of ice and rock. We’ll see lagoons, rivers and tunnels within the glacier gleaming in many shades of blue. Once we have conquered the glacier we’ll return to our lodge for a well-deserved meal and a leisurely evening. If the weather is good we shall kayak to the turquoise icebergs. If not we’ll sail downriver. Either way, we’ll be greeted with glorious views. Passing the granite walls of the Paine Mountains, we’ll finish our journey at Serrano River. We’ll drive to Puerto Natales, check into our hotel and have dinner. 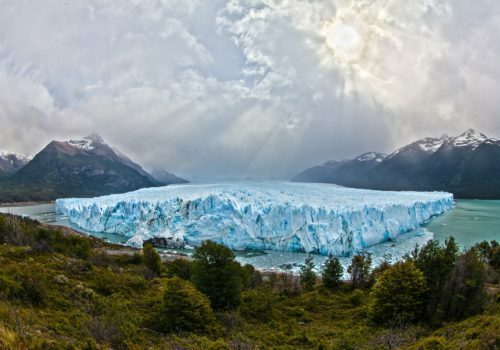 Weather permitting, we’ll go sailing and gliding along the Patagonia Fjords, visiting the Serrano and Balmaceda glaciers. We’ll see cormorants and sea lions along the way! At Puerto Toro we’ll visit Bernardo O´Higgins National Park where we’ll trek to the Glacier Serrano viewpoint. We’ll sail to Balmaceda Glacier and have lunch.